New Year is an indispensable part of the tradition of almost all the nations of the world. One of the festivals that have been celebrated in Bengalâ€™s tradition is the Bengali New Year, Pahela Boishakh. From the earliest times the Bengalis have been celebrating the first day of Boishakh as the New Year. New Yearâ€™s Millennial History, tradition, customs, customs, rituals and decorators and carriers of the culture. Pahela Boishakh is the biggest public festival of Bengal. Bengalis forget this yearâ€™s failure of year-oldness, despair, drowsiness and joy in the New Year, hoping for prosperity and a happy life. According to most historians, Mughal Emperor Akbar is the founder of Bangla or Bangabandh. After reaching the throne in the nineteenth year of the ascension, he felt the urgency of introducing Bengal in the convenience of collecting rent. According to the order of the emperor, his Amir Fateullah Siraji was introduced in accordance with solar energy and Hijri and introduced Bangla. In addition to that, he also named the Bengali twelve month in conjunction with the name of the star. In that case, the name Boishakh came in the same way with the stars of Bishakha. In English 1585 and Hijri 963, Bangla was introduced. The festival of Pahela Boishakh begins from the time of Akbar. However, at that time it was mainly the celebration of the revenue collection. So the concept of Bangla New Year was very ancient, but before 1967 the tradition of celebrating the New Year was not very popular. In 1954, during the rule of the United Front government, the first public holiday was announced for the first time in Boishakh. Later, during the rule of Ayub, when the ban on the celebration of the New Year was announced, in the face of intense protests by the Bengali movement in 1964, again the government holiday was announced on this day of the New Year. Above all, in the protest of the cultural oppression and exploitation of the Pakistani ruling class, since 1968, the first Boishakh takes place on the day of national festival, through the festival of Chhayanaut in Ramna Botomul. At present, the festival of life of Bangalee has become the first Boishakh regardless of race, religion, caste, age, class, and occupation. Even though there is a close relationship with the Bengali people of the New Year, but now the application of the festival of the year has spread to the cities. Every year the festival of the capital begins with the song Esho Hey Boishakh (Come on Boishakh, come, come). The festivalâ€™s main organiser, Chhayanaut Pahela Boishakh, organised the event in the morning. One of the essential parts of the capital's annual festival is Mongol Shobhajatra. At the initiative of the Faculty of Fine Arts of University of Dhaka (DU), the procession started from the Faculty of Fine Arts of DU in the morning of Pahela Boishakh, and after completing various roads of the city, it was completed again at the Faculty of Fine Arts. In this procession, people of different classes and occupations participate in the arts and faculties of DU as well as teachers and students of the university. Ananda Shobhatra, organised by then Fine Arts Institute of DU for the first time in 1989, has since been celebrated every year in the name of Mongal Shobhaatra since 1995. Through the Mongol procession, the traditions of Bengal are highlighted by carrying symbolic artwork, color-brooding masks, and replicating of various organisms of Bengali culture. Besides, various cultural organisations such as Bangla Academy, Shishu Academy, Bangladesh Shilpakala Academy, Bulbul Lalit Kala Academy and other organisations organized various day-long programs. About village life and New Year interconnect in the New Year, people from rural and urban areas used to smoke new food and drinks. After all the new clothes, friends, relatives, neighbors, and all of them meet each other with unlimited joy. New speed is also involved in trade and commerce. In other cities outside of Dhaka, local people celebrate New Year in great pleasure. It organized various fairs and cultural tournaments. Apart from the Bengalis, minor ethnic groups also celebrate Bengali New Year with great enthusiasm. Celebrating the New Year in the three Hill Districts (Bandarban, Khagrachari, Rangamati) is a very versatile center. The Chakmas are called Bijhu, Marmara, Sangrai and Tripurara Besuk. The names of these three festivals are vaiyabai Small ethnic groups celebrate their traditional religious and social festivals in an eclectic environment. The Bengalis of Paschimbanga celebrate Bangla New Year outside the country. Saray Chaitra continues for the month to prepare for the year. Chhatak Puja is celebrated on the last day of Chaitra ie Chaitra Sankranti or Equinox. The day is celebrated in the month of Pahela Boishakh on the occasion of the festival. Besides, there are diverse decorations of various confectionery including chiram, mutti, khaye, air, and the Boishakhi fair. The fair is now the largest folk fair in the fair. It is a unique reflection of rural life. Halkhata basically closes the accounts of the traders old year and the opening of new accounts. It has been practiced since the time of Akbar. In the meantime, the rent was paid in the last days of the month of Choitro, and land owners in the first month of Boishakh used to go to congratulate the people of their respective regions. This is called Halkhata. At present, traders open old accounts books on New Yearâ€™s day and open new accounts. Old Halkhata festival is celebrated in old Dhaka. There are also various sports competitions in the villages. Notable among these are boat, stick box, wrestling and gambhiras, regional folklore of folk songs and folk dance. In Bangladesh, the biggest event of wrestling or ball bearing is mainly in Chattogram. 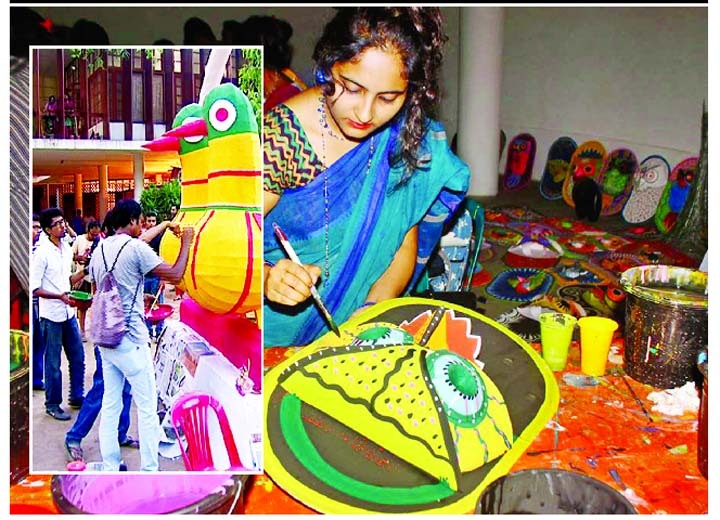 Pahela Boishakh comes back every year to strengthen the foundations of Bengalâ€™s traditional heritage. People forget about the year-long clay-dally, disappointment. In particular, its effectiveness in city life is much more. Because, the people of the city are almost forgotten about the Bengali mindset all year long under the pressure of citizen life. Bangladeshi people came to the New Year and touched the minds of the residents of Bangaliana. The Bengali people got renewed in the inspiration of the New Year. Become aware of its own history, heritage, culture, customs, and rituals. Basically, Pahela Boishakh is the first day of the Bengali calendar. It is simply called as â€˜Bengali or Bangla New Year.â€™ New Year is our national festival. It is celebrated in Bangladesh, Paschimbanga, in Bengali communities in Assam and Tripura. In Bangladesh, Pahela Boishakh is celebrated on April 14 is a National holiday. In Kolkata and Assam it is a public holiday celebrated on April 15. On Kolkata, the people wear new clothes. The entire month of Boishakh is considered to be an auspicious time for marriages. Bangla New Year is the day for cultural programmes. Young ladies clad in white sarees with red borders, men in dhuti and kurta, take part in the Probhat Pheri processions early in the morning to welcome the first day of the year. It is considered as an auspicious day, for new businesses and new ventures in Bangladesh. Usually on Pohela Boishakh, the home is thoroughly scrubbed and cleaned, people bath early in the morning and dress in fine clothes. They spend much of the day visiting relatives, friends, and neighbors. Special foods are prepared to entertain guests. Basically, Pahela Boishakh teaches non-communalism with our national consciousness or a non-Bengali person. On this day, we can understand that there is no particular religion, but a single integral Bengali entity can pass this feeling. In front of this day children can know about the history of Bengalis. New Year brings new life into us. Above all, through the inspiration of the New Year, the latent human values among us are awakened; people have developed harmony among people. It has taken everything in the way of the progress and development of human civilization. Some of them are positive and some negative. Bangla New Year, Bengali Festival of Life. The Bengali people celebrate this festival with its own culture and customs. But at the present time, the penetration of foreign culture has spoiled the traditional Bengali festival. Foreign culture is taking place in dance-songs, fairs and sports competitions. In this, people are deprived of the true taste and contentment of celebrating the New Year. The festival celebrates the celebration of various occasions and delivers the original joy of the extra-funeral festival. People are becoming indifferent to their own tradition and culture. In fact, there have been some unexpected changes in the previous yearâ€™s New Year and the present; which is a threat to the Bengali nation and its own culture. Pahela Boishakh is not just a festival in our life but it is a reflection of a spirit. It proves to us in humanity, by making people vulnerable to discrimination in human beings.